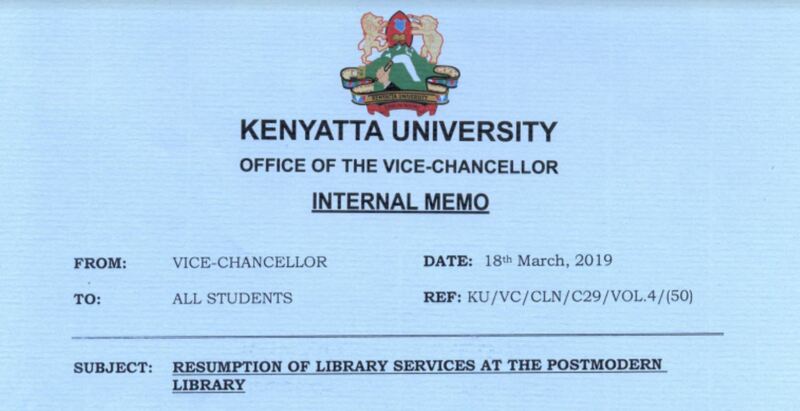 Below is a statement from Kenyatta University on the tile breakage incidence close to the lift at the postmodern library that caused a scare on Monday 18th 2019 noon. There was an apparent safety scare at the Postmodern Library today, Monday, 18th March, 2019 at about 12 noon. Following this incident, this is to clarify that the noise that triggered the scare was a result of impact of breakage of floor tiles on 3rd floor next to the lift. The few students who sustained injuries are receiving the necessary medical attention, and some have already been discharged. The library is very safe and the normal library services should resume today, Monday, 18th March, 2019 at 3.30 p.m. The students and staff who may have left their personal items following the scare should check with the service counters on each floor, and will be required to identify themselves and their items before they are issued the same. The library users who happened to have left with library books and items are requested to return them at the library’s circulation desk without fail. Library users who may have picked other user’s items are also advised to surrender them to the library at the circulation desk.